Established in 1997, the locally owned and operated Winchester’s Grill & Saloon and was the genesis of the rebirth of downtown Ventura. The casual-themed steakhouse was the first to offer patio dining on Main St., and quickly became known for their high-quality steaks, burgers, seafood, and even exotic meats such as elk, bison, and venison, at very reasonable prices. And a special kids menu as well! 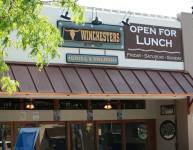 Their 41 draft beers have made them key contributors to the craft-brew revolution, and the “Winchester 45”, is one of the finest collections of craft whiskeys on the central coast. Happy Hour food & drink specials are available Monday-Friday from 4 pm -6:30 pm. Dine-in only.